A proud member of Preferred Hotels and Resorts. A luxury oasis located on the sparkling Sea of Cortez, this all-suite, Unlimited-Luxury® resort boasts opulent suites with ocean views. Its architectural arches welcome couples, families and friends to an exclusive world where everything is included. You are close to the quaint art shops, championship golf courses, restaurants and nightlife and some of the world's best marlin fishing. Ask about complimentary wedding and honeymoon packages. 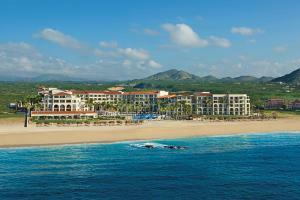 On the beach next to the Melia Cabo Real and the Cabo Real Golf Course, 25 minutes from the airport. Bordeaux - à la carte French cuisine, Adults-Only; Oceana - à la carte seafood; Portofino - contemporary à la carte menu of Mediterranean specialties from Northern Italy; Seaside Grill - Steaks and other grilled specialties à la carte; Coco Café – early morning through late night bites; Barefoot Grill - light lunch specialties in a casual and relaxed outdoor setting; World Café - buffet-style international restaurant with a cooking show experience and theme stations; and 24-hour room service. Desires Music Lounge – dance the night away; Manatees – swim up pool bar; Sugar Reef – swim up pool bar; Rendezvous – live music lobby bar. Golf, Fishing, Horseback Riding, Cabo Real Golf Course, Whale Watching, Pirate Ship Cruises, Scuba and Snorkeling.